The Abia Progressives Forum (APF) has threatened to sue the Federal Government and the Economic and Financial Crimes Commission (EFCC) if they fail to include the name of the immediate past governor of Abia State and current Senator, representing Abia Central Senatorial District, Chief Theodore Orji in the government’s list of looters. The group alleged that the ex-governor and his family looted several billions of naira meant for the development of the state when he held sway as governor. 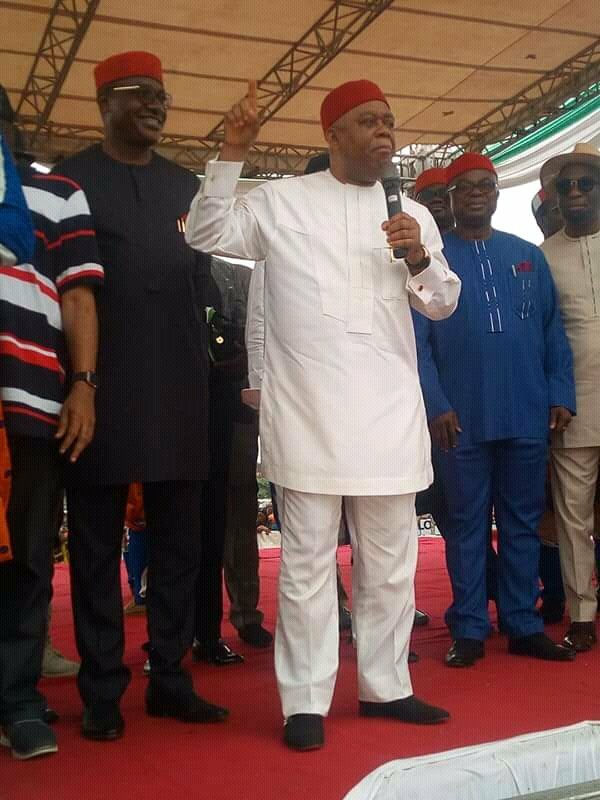 Addressing newsmen, the Chairman of the Abia Progressives Forum, Mazi Okechukwu Okwuonu, explained that the call for the inclusion of T.A Orji’s name in the list was borne out of the desire to ensure that the monumental fraud, which characterized his government when he was at the helms of affairs in Abia would not go unchecked. Okwuonu called for the prosecution of the former governor and his son, Chinedu, who is currently the Majority Leader of the State House of Assembly over alleged corruption. “President Muhammadu Buhari anti-corruption war will not be complete if the Presidency and EFCC fail to beam their searchlight on Senator Orji and his cohorts. “In fact, to set the records straight, the looting under his administration was unprecedented and massive. That is why Abians did not witness any development in the state. “We will sue the Federal Government if it fails to include the former governor’s name in the looter’s list. Following facts and figures at our disposal, the former governor looted over N7 billion meant for the development of Abia. “If the Federal Government fails to act on our call, we will take them to court. Abians are anxiously looking forward to the prosecution of Orji for financial fraud. “Also, let us state it clearly that we have uncovered secret deal carried out by the former governor in collaboration with an EFCC official who happened to be an Abia citizen of Ikwuano extraction, to kill corruption charges against him”, Okwuonu disclosed, saying that this would not be allowed to stand. Buhari should stop diverting public attention to the looters list. Buhari was not elected to recover loot alone. Why are we not discussing Buhari’s nepotism, tribalism, clannishness, and religious bigotry? Prosecution of looter should be left to the justice ministry and not limited to PDP members and Jonathan’s administration alone. We had looters during Buhari, Babangida. Abacha, Abdulsalam, Obasanjo, Yaradya and Jonathan. Why distract Nigerians with with a fèw billions stolen during a Democratic regime of Jonathan that had checks and balances. While ignoring the trillions looted under the previous military regimes without checks and balances? The Abacha loot still being returned today by other countries is a pointer that Buhari’s attention to Jonathan and PDP is a mere distraction. Fight against corruption should be holistic and not vindictive or attention diverting from obvious leadership incompetence and failure. The national assembly that ought to be the performing oversight seems to be afraid of its role in democracy. They should wake up and borrow a leaf from a fellow African Parliament of South Africa. They should summon courage and not allow the fear of EFCC and blackmailing trials at CCB dissuade them from salvaging the nation from incompetence and bigotry. Senator Abaribe’s courage should be encouraged not subdued. What prevents the National Assembly from inviting the president to explain his obvious incompetence and clannishness especially in security matters leading to blood shed across the nation, with apparent connivance of security forces dominated by the tribal group of Mr president.